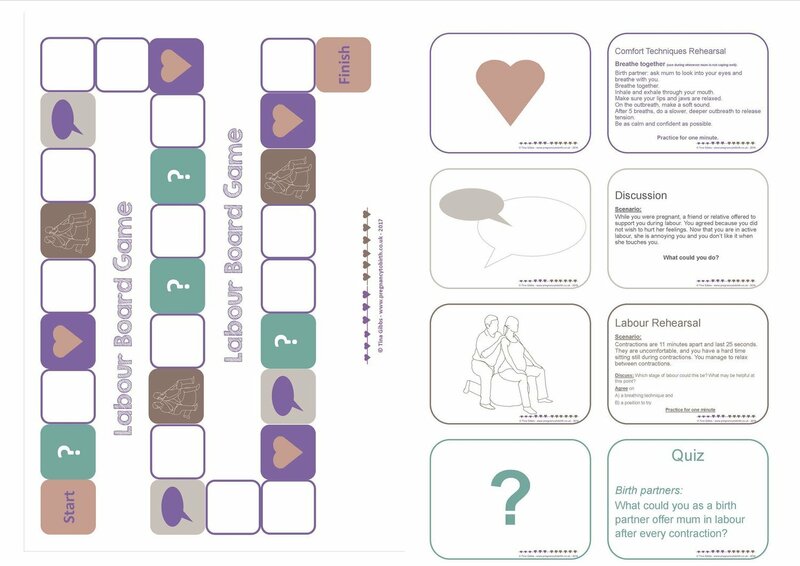 Labour Board Game - Can be played in small or large groups to rehearse or review labour. Great activity for refreshers (subsequent parents). Parents-to-be roll the dice and move the counters. Land on a picture field, pic a card and follow the instructions. 4 card categories: Quiz, Discussion, Labour rehearsal (scenario, parents to decide which stage of labour that is and to agree on one breathing exercise and position - practice for one minute), Comfort Techniques rehearsal (instructions incl. when to use and benefit on card. Parents to follow instructions and practice for one minute). Available in different sizes. Board A3 or A4. Cards available in A5 and A6. You'll also need dice, counters as well as positions probs such as birth ball or pillows. Takes between 20-60 minutes - depending on whether parents compete (move more than one counter at a time) or whether the whole group (or groups) move one counter only for the whole game.